The pinnacle of technological prowess, the Lander is our finest desk system. Factory pre-assembled and tested, the Lander is up and running within just minutes of unboxing, no tools required. The Lander features an advanced height control paddle that syncs to your smartphone through Bluetooth. 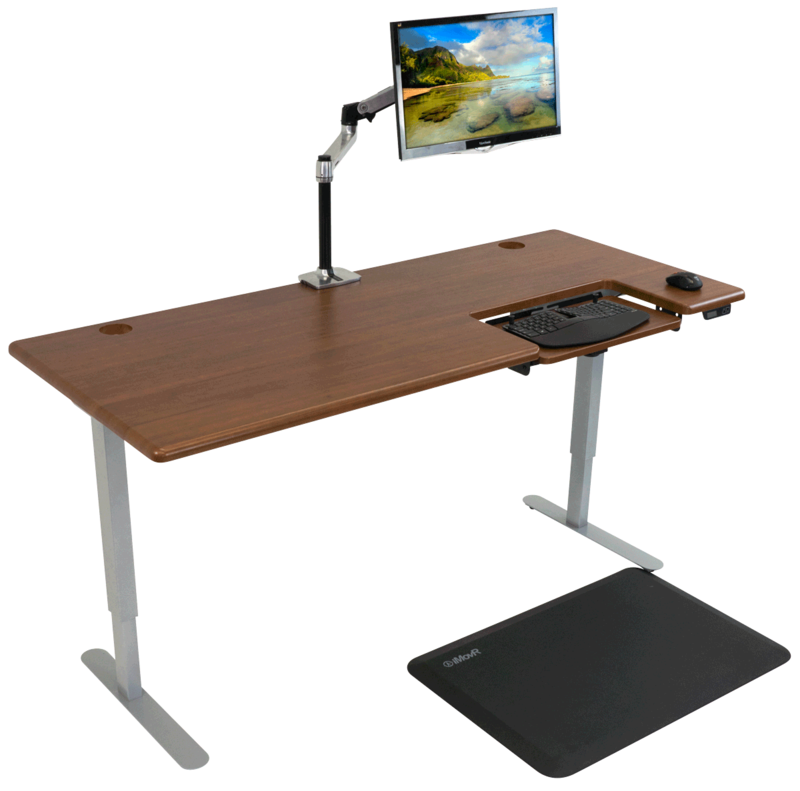 Not only does this mean easy and intuitive height adjustment, it means each user can take their own height presets and health coach notification settings with them to any Lander desk in the office. Lander desks come with or without our patented, built-in SteadyType® ergonomic keyboard tray, and in any width from 41” to 83”. Extraordinarily stable, the Lander is our top performer in every specification, with a super-fast 1.6 inches-per-second transit time, super-quiet dual motors, and brawny 360 lbs. lift capacity. Lander desks are also available with our ultra-premium solid wood desktops, in a robust array of 36 species and stain combinations, all sustainably grown and manufactured in the USA to the highest craftsmanship and environmental standards. Available either in the standard rectangular version or equipped with SteadyType. 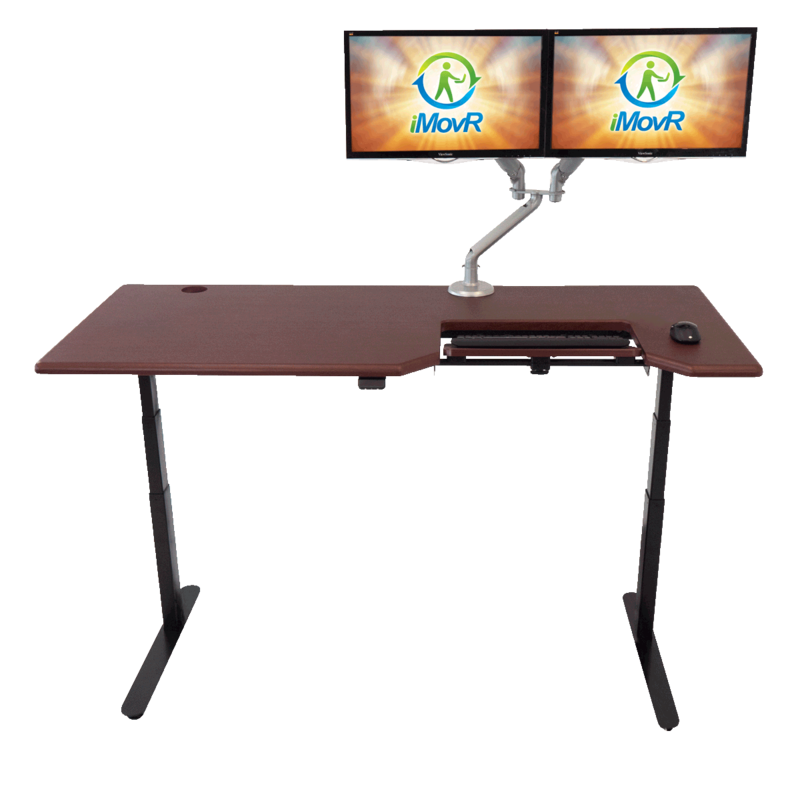 The Lander is also our platform for the iMovR L-desk Series, revolutionary in its incredible range of size and color configurations, and its ease of assembly in under ten minutes. 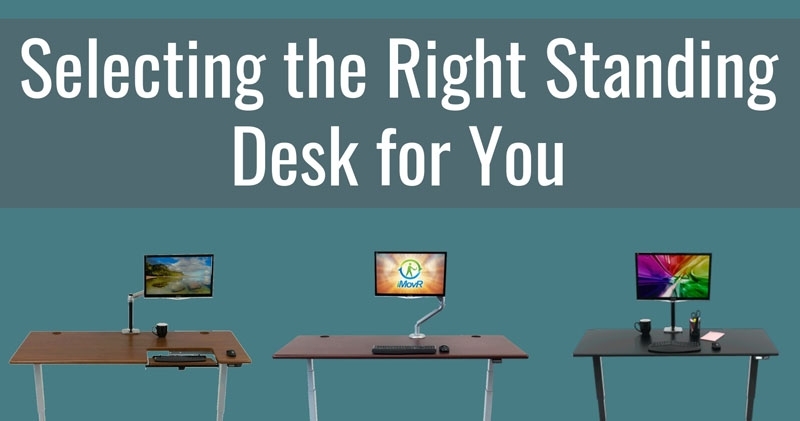 Learn more about Lander Desks. 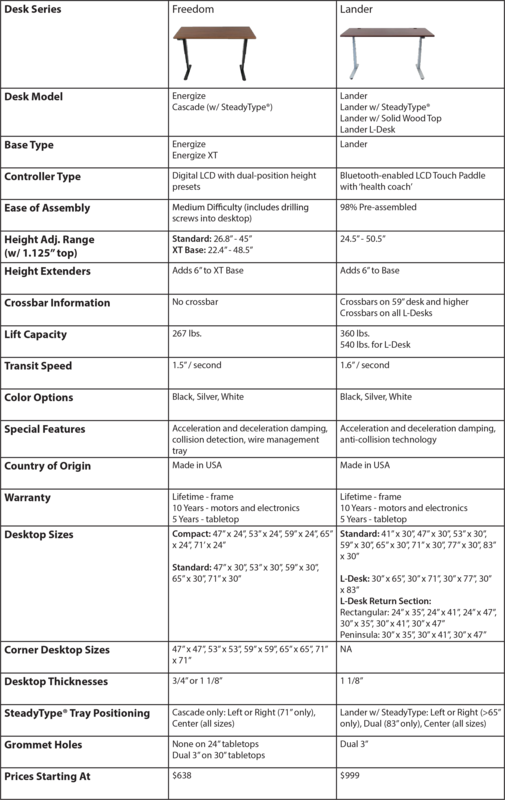 Or see our Desk Model Comparison Chart below. 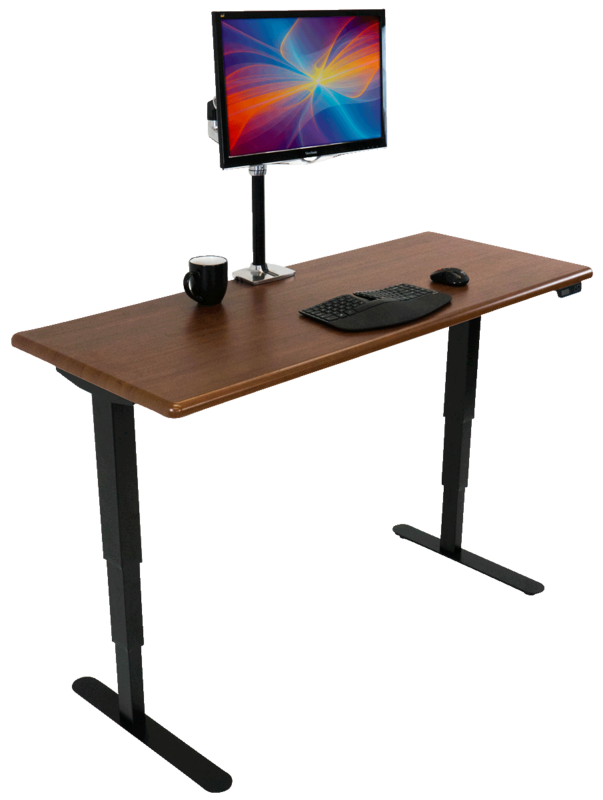 The lowest-cost American-made standing desk on the market, the Freedom series features over 3,500 combinations of base and desktop sizes, shapes and colors, making it the most customizable desk in the world. The Energize Desk is vastly easier to assemble than most any other standing desk on the market (except for our pre-assembled Lander desk, of course). 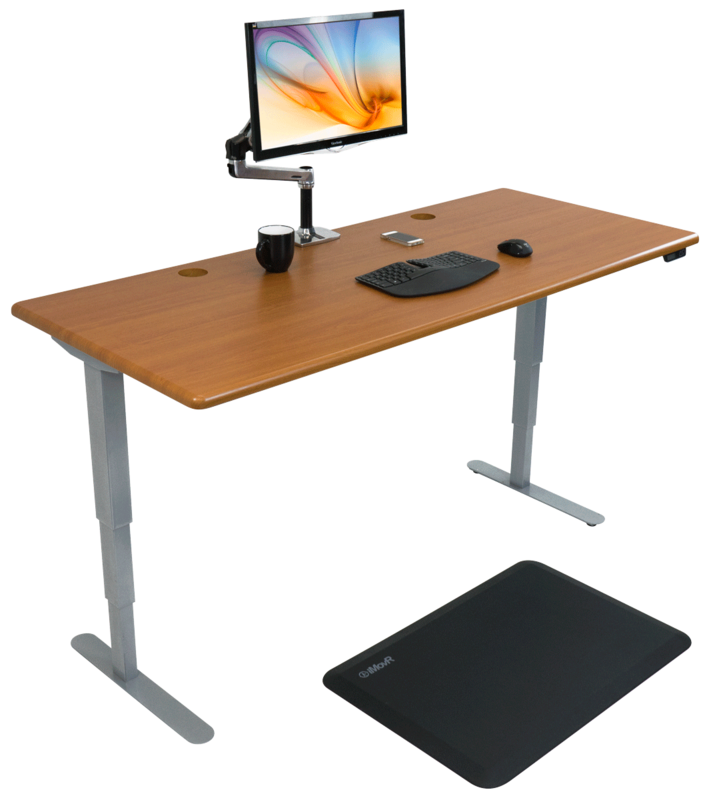 The simple two-button controller features an LCD display and two programmable height presets – one for sitting, one for standing. The Energize comes in three different base versions for single-stage (lowest cost), dual-stage (BIFMA height range) and “XT” extended dual-stage for up to 55” of height. Desktops are available in both 24” and 30” depths, widths from 41” to 71”, and in slim-line (3/4”) or more traditional Select (1-1/8”) thicknesses with ergo-contoured edging. A medium-duty frame compared to the Lander’s heavy-duty platform, the Freedom desks can lift up to 267 lbs at a transit speed of 1.5 inches-per-second, and feature dual, precision Bosch motors. The same desk is also available with our patented SteadyType® built-in ergonomic keyboard tray, known as the iMovR Cascade desk. 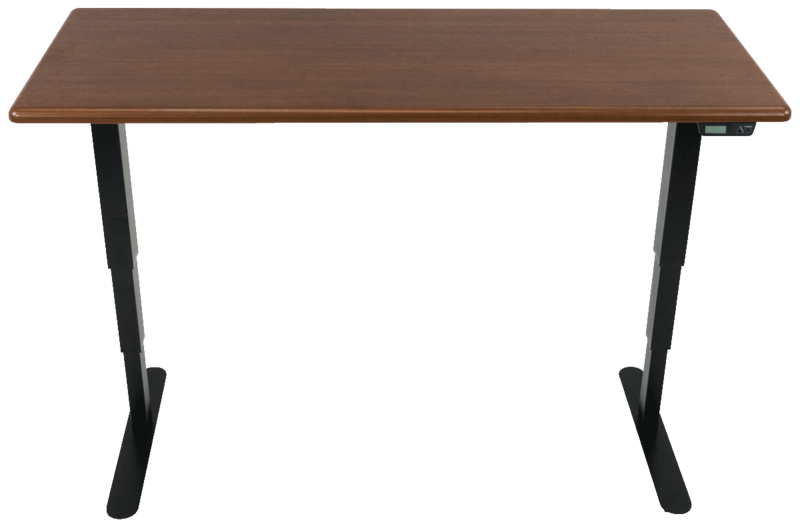 We also offer a wide variety of corner desk options in both the Energize and Cascade renditions. 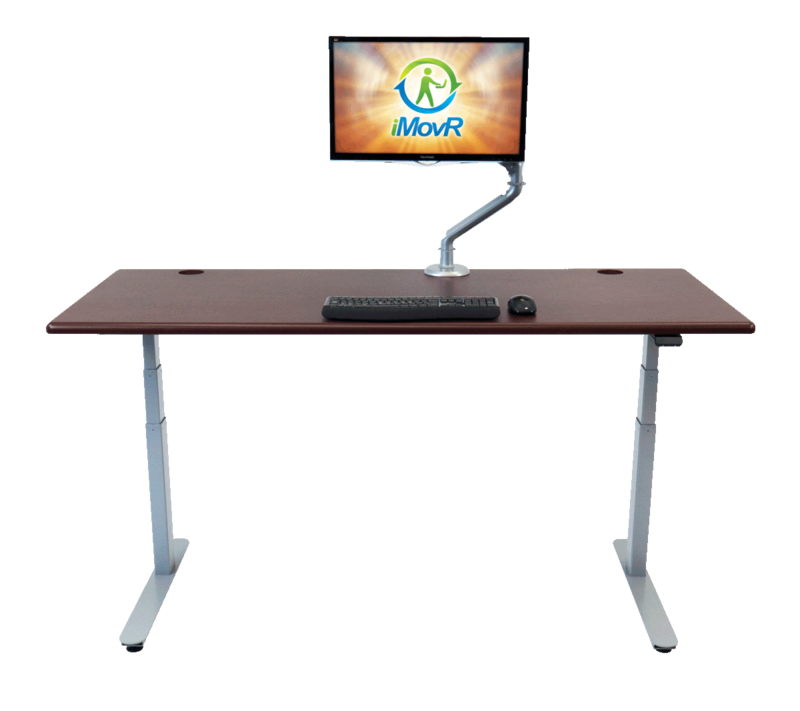 Learn more about Freedom Desks. 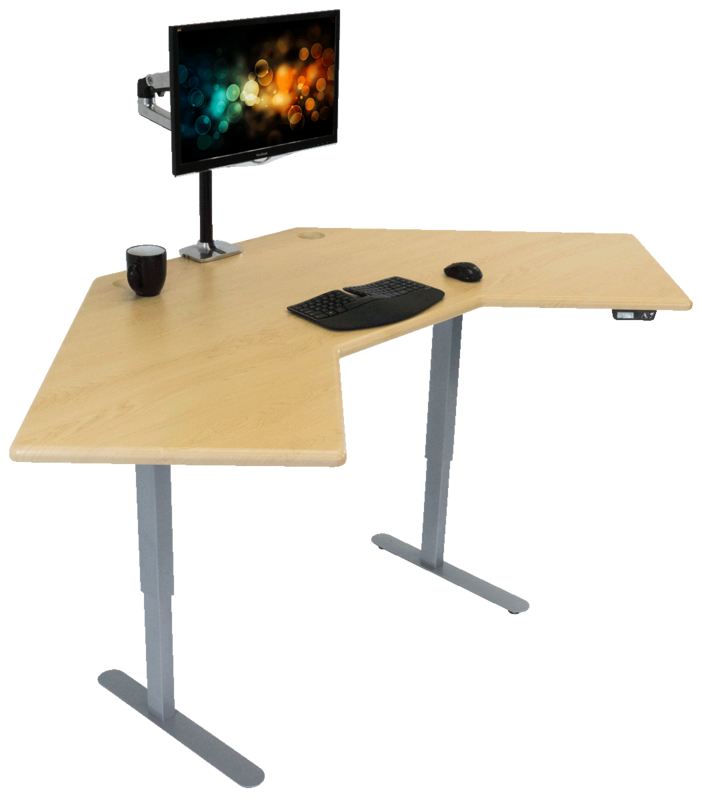 For more specs on individual desks, visit the Freedom and Lander product pages. iMovR leads the office fitness industry in breadth of options, high-tech features and made-in-America quality. 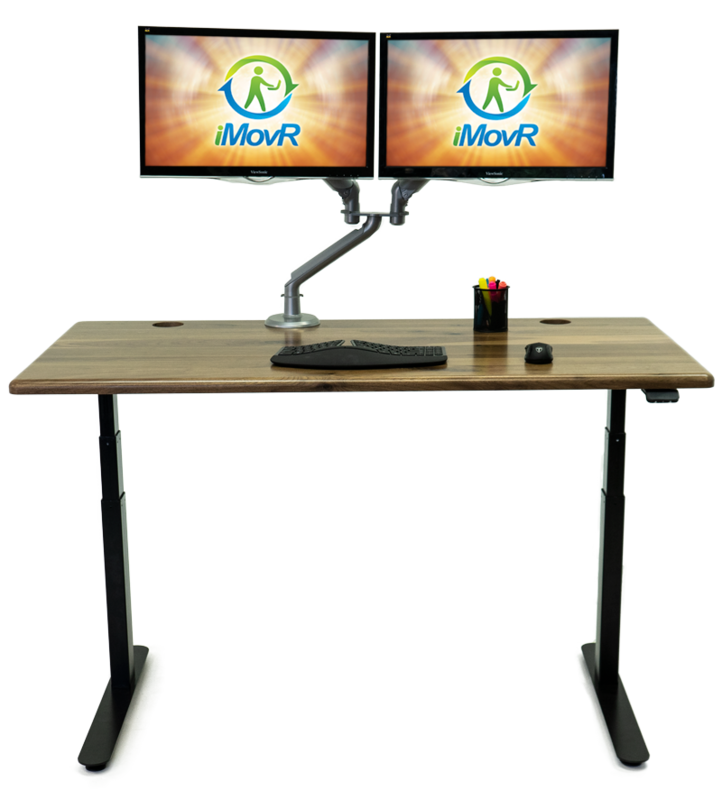 iMovR backs all of our desk products with an industry-leading 10-Year Warranty on the base and 5-Year Warranty on the desktop. (Most of our competitors offer no warranties on their desktops). 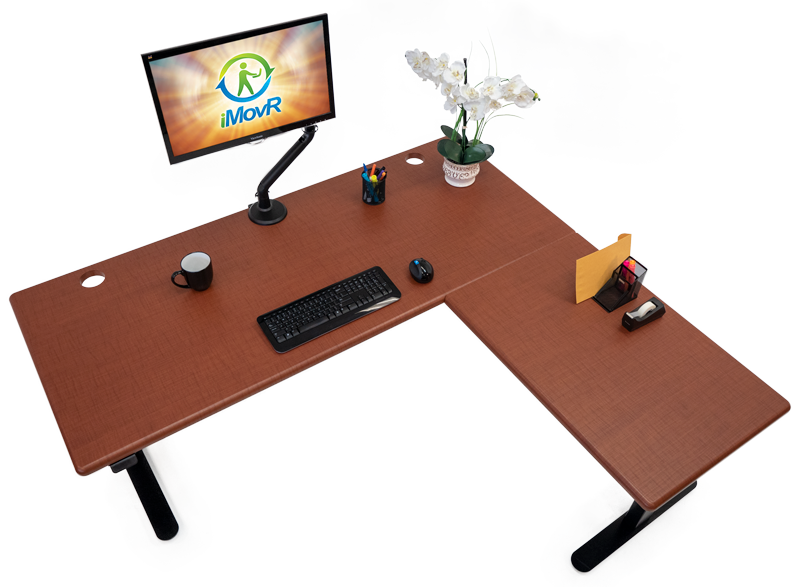 iMovR’s exclusive 3D-laminated desk surfaces are not only more elegant than old-school lamination, they’re more resistant to scratches, dings, and even harsh cleaning chemicals – and they’re far more environmentally sensible. Our 16 3D laminate colors include solids, wood grains, carbon fiber and nebulae selections. 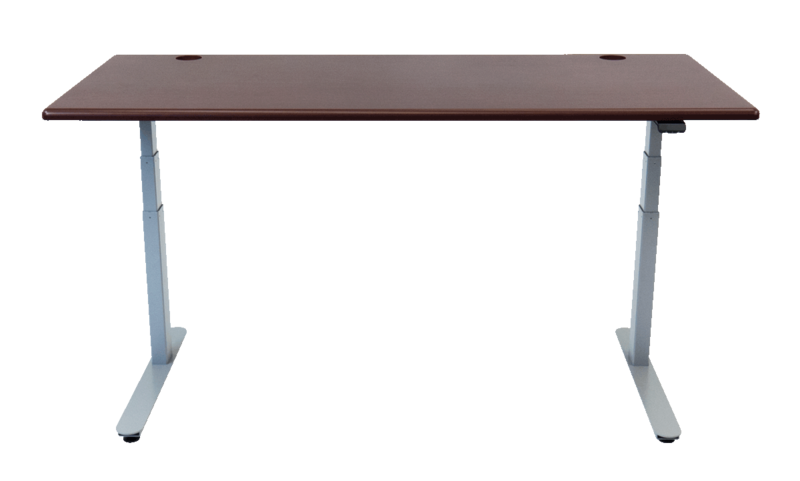 All our desks are NEAT™ Certified by the Mayo Clinic and exceed ANSI/BIFMA specifications for top height range (up to 55” with optional leg extensions) and stability. Whether you’re buying one desk for your home office or hundreds for your organization, you’ll quickly fall in love with our product quality, world-class customer service, and unparalleled value. We’re so confident you’re going to love your new iMovR desk that we also back it with a 100-day complete satisfaction guarantee. Still have questions? Take advantage of our highly-trained workplace wellness product specialists through live chat, email, or by calling us at 888-208-6770, x1. They’ll be more than happy to guide you to the best products to suit your needs. For enterprise sales and bulk order pricing, select x2.